Me: "Umm. Hi. Hello. 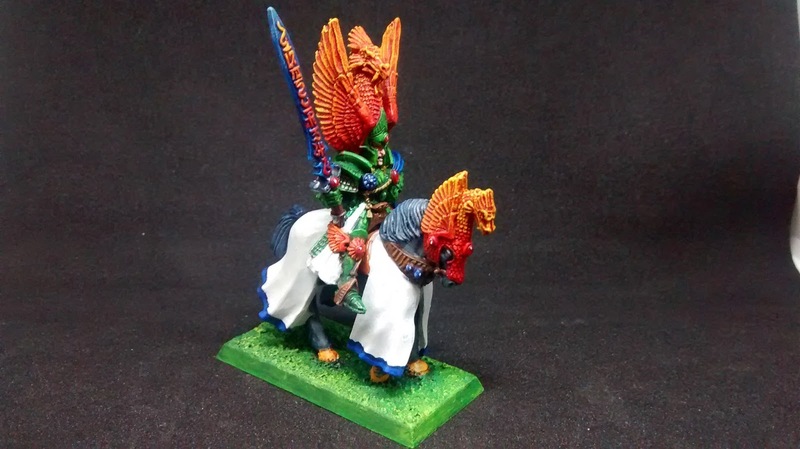 My name's Paul, and I'm addicted to High Elves. Me: "So.... I've been keeping hold of the High Elf army I started when I was 14 and got the WFB4 Box Set, you know the one with all the chunky monopose archers and spearmen that most people hate?" Group: "Uh huh, yeah, we do, carry on Paul. You are doing great." Me: "Umm. Thanks everyone. Well, you see, it gets worse. I'm fixated on this concept of painting a whole host of Caledor themed High Elves, in the same shiny metallic green and primary colours as I did when I was 14! Gah! There. I said it..."
Group: *polie and supportive applause* "Well done Paul. That can't have been easy." Me: "No. No it wasn't. So, can you guys help me kick the habbit? 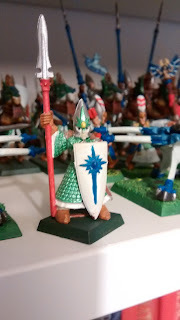 Can you help me get off the High Elf monopose plastic crack!?" Group: "Hell no! 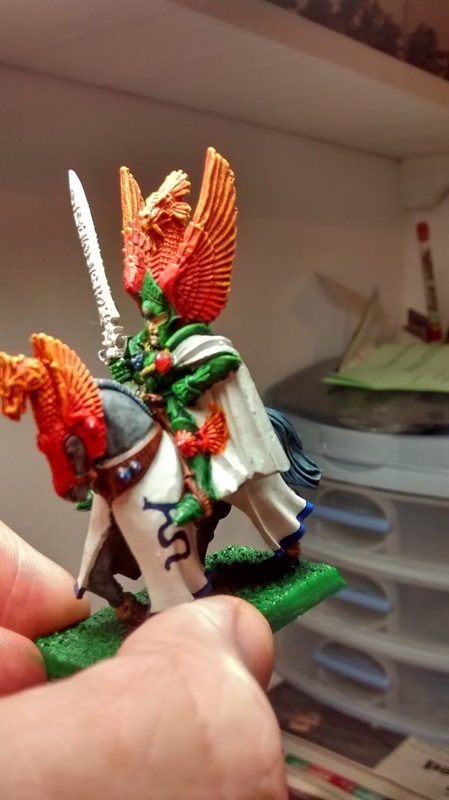 We are going to enable you and facilitate even more painting of High Elves in garish primary colours!!!" *Chanting growing in the back ground* "One of us! One of us! One of us!" And that, dear reader, is almost exactly how it happened. My indoctrination into the online cult masquerading as a self help group known as High Elves Anonymous (fallen brethren welcome), came swiftly after it became clear that there were a number of us fellow Elf Nuts (sorry/not sorry) taking part in the Tale of Middlehammer Gamers monthly challenges via the Middlehammer facebook group. 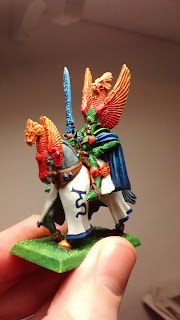 September's challenge was to pledge a number of minis towards whatever force you are currently (or, rather should be!) 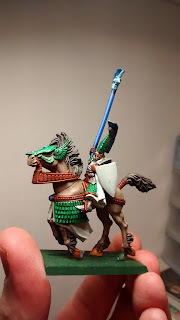 working on, and I pledged 4 Archers (to 'complete' a unit of 26), a Silver Helm Standard Bearer (to 'complete' a unit of 10), and Prince Tyrion on his war pony Malhandir- following on from August's Procrastinators Challenge this seemed an apt choice seeing as I have owned Tyrion for just over 20 years, but have always been too scared to paint him! 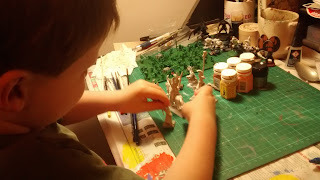 I must confess that I had some help with this project from Son #1, although he did think they should be more worried about the Snotling invasion on the other side of the table! Why do you look so alarmed Mr Spearman? Is it your lack of ink wash making you feel naked and unfinished? No....? 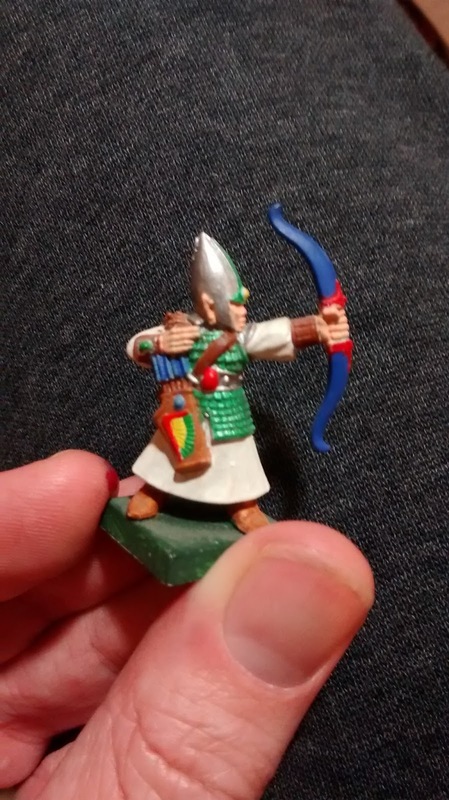 Oh, it's because of the garish colour scheme on this archer! I don't know what the hell is going on here. 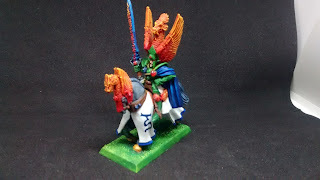 The colours on the wings on the quiver are like the Jamaican fla.... Oh wait, yes I do. 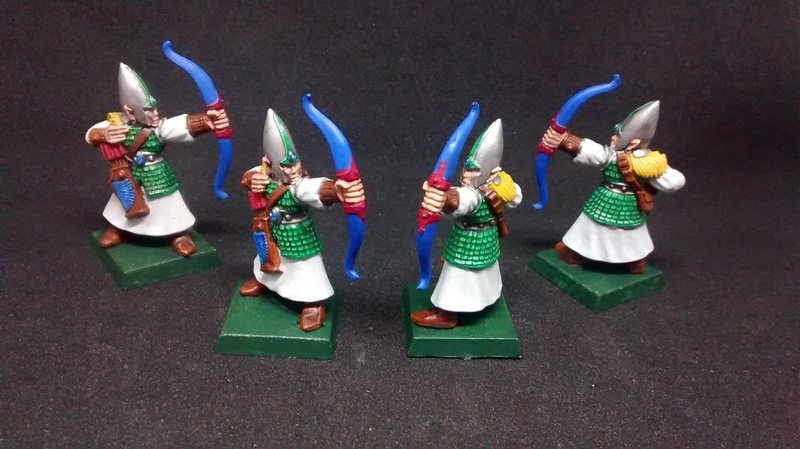 I have two pretty large units of archers already painted, dating back to 1994, and a few rushes of productivity between then and now. 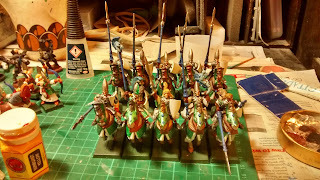 They will eventually be two units of 26 inc command, but that means they need sprucing up and a more unified colour scheme as there is a lot of variation in quivers and fletchings. 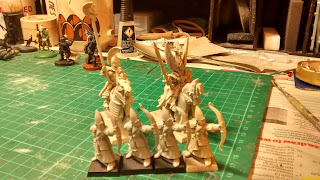 These four will serve as a template for the updates colour scheme. 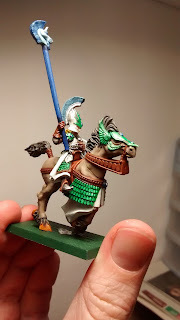 The first model I actually finished (and for some reason this means it got missed off the solo shots in the light box - apologies) was the Silver Helm standard bearer. I have plans for a pennant banner at some stage, but I need some practice first, so that is for another time. I have a shield related issue to address at some point. Too many elves and not enough shields. Once I know what my plan is across the whole force then I will come back and sort out the shields, but for now they remain blank. Did I mention I was a bit scared of putting paint on Prince Tyrion and Malhandir, king of all Shetland ponies? 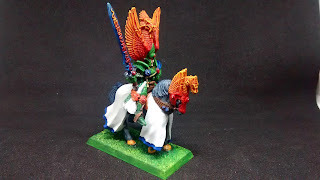 The stellar job I had done on his brother Teclis (not to be shown here) had not filled me with confidence I can tell you! I needed a boost to get me started, so made sure I had a good lunch. Well sort of good. 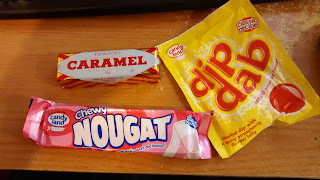 Missing two of the five essential food groups - nuts and crisps, but what you can't see here is that I had a Cheese and Salt and Vinegar crisp sandwich first. 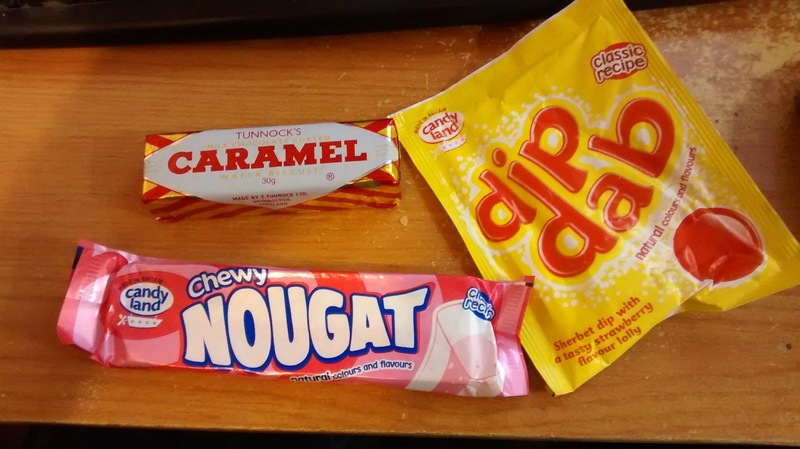 So this was desert. I'm not an animal. Right! That was better. 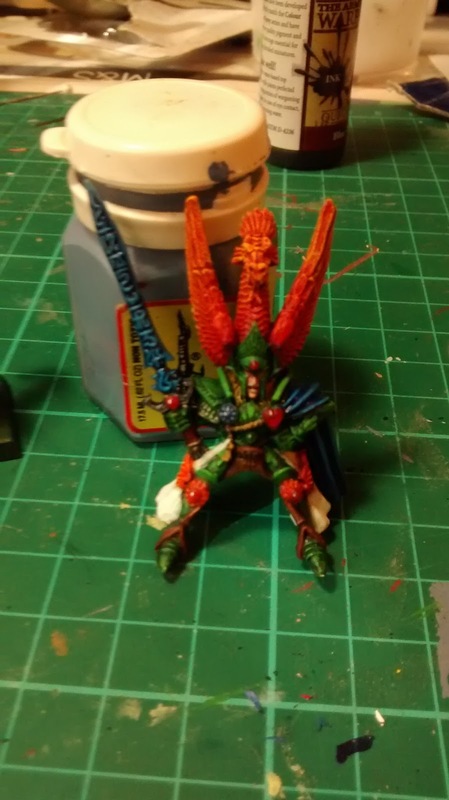 Braced by sugar and later some dutch courage I summoned up the courage to go with what I wanted for this model and to paint him up in a Dragon Prince-esque style, slapping on some dark green and fading up to acid greens and yellows, and a matching red to orange-yellow fade on the head pieces of Tyrion and Malhandir. I have to say I was pretty chuffed with that! I knew I didn't want the cloth barding to take focus away from Tyrion, but I also knew I didn't want to leave it blank. 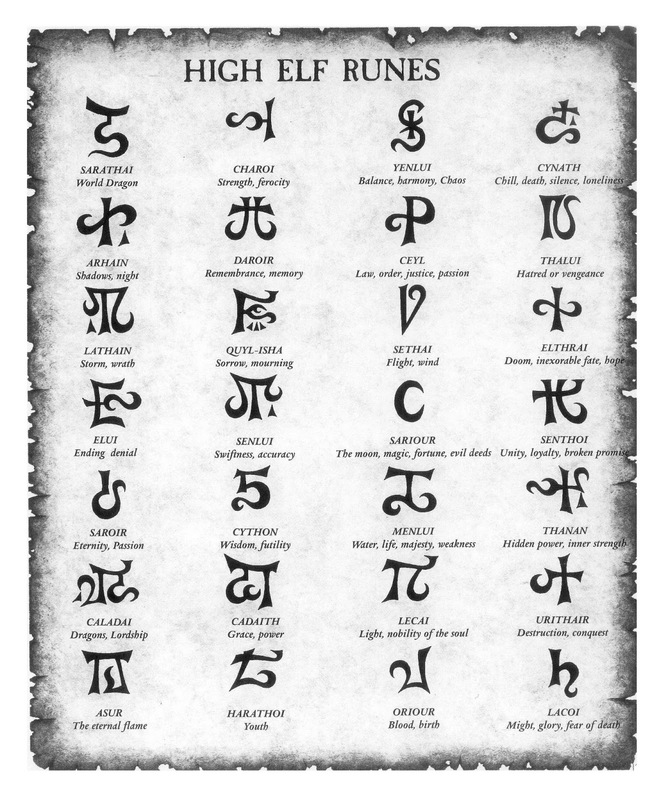 Referring back to the original studio version I decided to locate a rune in the same front left portion, as it seemed to balance the model well (it wouldn't look right on the side with the sword imho). 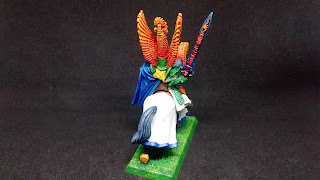 Keeping with the Caledor theme I decided to go with the rune Sarathai (the World Dragon), which also appears on Tyrion's Rune Sword, Sunfang, so it seemed appropriate for hat reason too. I added a blue trim to the bottom of the cloth, but other than that have left it as a block of white. 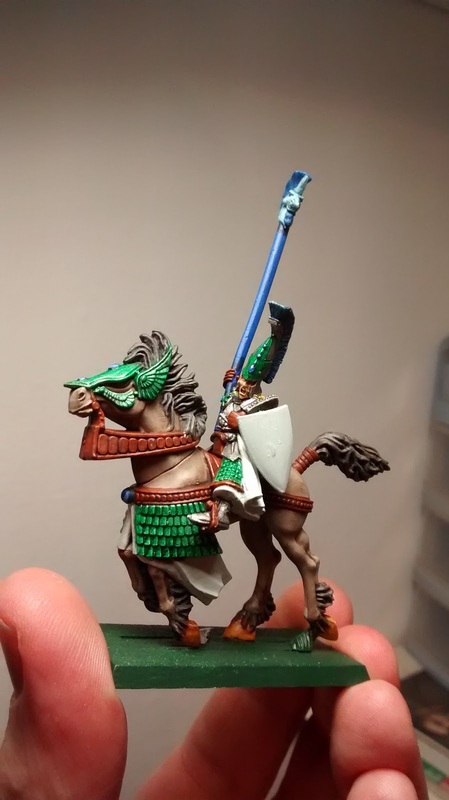 It is a High Elf war pony after all! I regularly put the two parts of the model together to check how the colour balance was going, especially before opting for a dark blue cloak which I knew was going to give Tyrion a much darker aspect than is traditional. 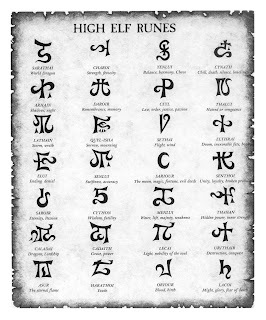 My intention was to have the blue sword picked out with ice blue-white runes and I shared the version below with the High Elves Anonymous group claiming it 'done' - but even as I shared the photos I realised the blue tone wash had taken a lot of the contrast out of the runes and it looked a bit flat. Credit and many thanks then to Anna B who advised using the same red-orange fade as for the head pieces, which you can see in the finished pictures below. She was not wrong! Indeed huge thanks to all in the High Elves Anonymous (fallen brethren welcome) support group both for their encouragement and valuable Elven lore! What the hell is that thing? 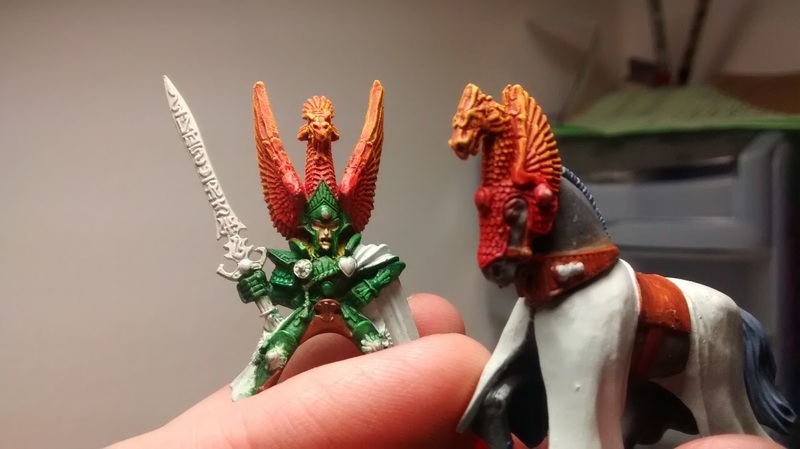 It's got a Dragon's head and an eagles wings. 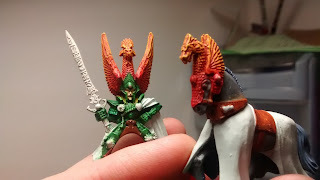 It's not a Griffin, it's not a Phoenix. What the hell is it!? 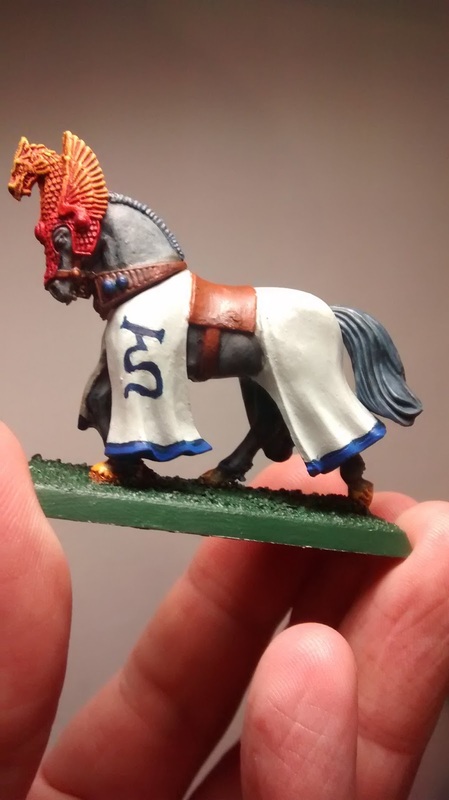 I've just realised I paint my fantasy horses without horse shoes... Huh. Might have to address that. 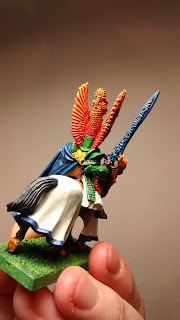 I've often mentioned my love of monthly painting themes and challenges when blogging, especially when they can be tied in with ongoing projects that need a bit of a boost. 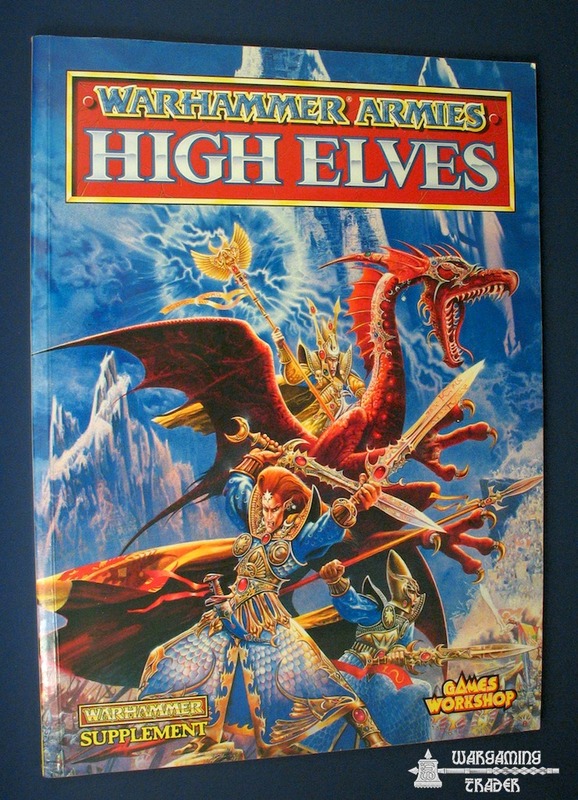 Well, Tale of Middlehammer Gamers (ToMG) really ticks all the boxes. 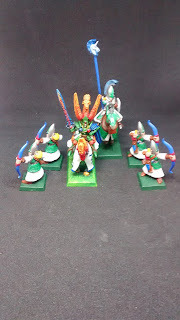 Not only has it spawned a new set of connections with my fellow Elf Freaks, but across the Middlehammer group more generally there has since been talk of meet ups and mini tournaments and I have thrown my hat in the ring not only with my High Elves, but potentially with my Orcs and Goblins too! 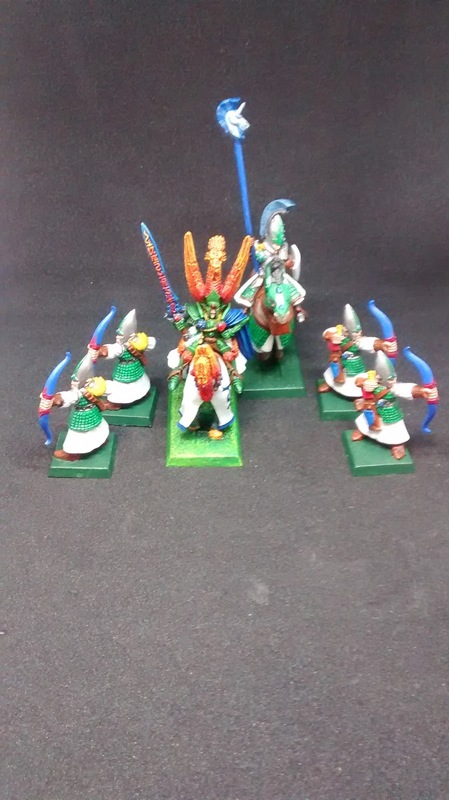 The ToMG theme for October Orctober is to work on your bases to get things battle ready. I have already confessed my sins to the group that I will be putting the Elf(s) on the Shelf for the month to focus on my Greenskins, but this challenge has really given me the gumption to get my High Elf host into battle ready shape. My 14 year old self would be proud! Thanks for reading. Do stop back for the next instalment in this Tale of Middlehammer Gamers!